Leaving the township school on a Friday afternoon to spend the weekend with family in Durban is like travelling from one world in to another. 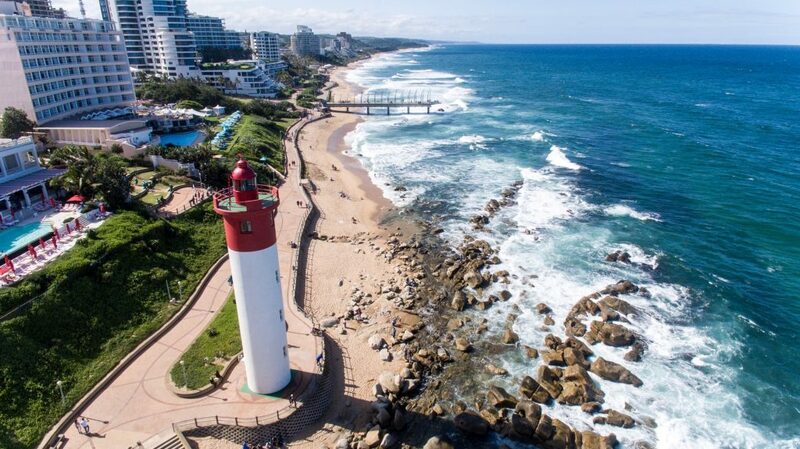 Umhlanga, a lush tropical community of impressive homes, lies north of Durban, nestled on the beachfront of the Indian Ocean. The village bustles with 5-star restaurants and plenty of boutiques for both locals and tourists to enjoy. The beachfront is busy every day with stylishly dressed people – even the Yorkshire terriers have bows between their ears and bedazzled collars – strolling along the boardwalk admiring sandy white beaches, or lounging on resort patios sipping strawberry daiquiris or ice cold lagers. Just 30 minutes away it’s an entirely different world. As you travel west, away from the beachfront, townships of small dwellings and huts can be seen snaking up the green hills alongside the highway, with dirt roads winding their way to the top. As you near Pietermaritzburg, the climate becomes drier, the grass turns to brown dirt, and the rolling hills melt into a flat horizon. Entering Slangspruit township, where I have been working for the past three months, you might well feel that you have taken a wrong turn somewhere along the highway and ended up in a different country. The contrasts are so stark. The road into the township is scattered with potholes the size of kiddie-pools. There are no traffic lights or stop signs, but you drive with caution as you never know when a herd of cows or massive mud-caked pigs will be around the next corner, crossing the road at an agonizingly slow pace. The grass is dry, trees are scarce, and the few that do survive the sweltering heat and lack of water bear no leaves. The ground is blanketed with trash as there is no garbage pickup in the township. Neighbors mound their trash into tall piles to burn. The smell of burning plastic and lingering smoke hangs in the air. Goats roam freely in and out of yards, and skinny, stray dogs rummage amongst the mounds of garbage. There are no parks or playgrounds for the children to play in. They have to use their imaginations to entertain themselves. Sometimes a pipe bursts somewhere up the street resulting in a shallow stream of murky brown water trickling down the side of the street. I’ve watched as children gleefully race pieces of trash down the makeshift river. The houses are the size of an average Canadian’s shed; usually one room with one or two windows, made of cement and bricks with metal sheets for roofing. Because there is no plumbing, if you don’t have an outhouse, people can be seen squatting on buckets outside their homes (which makes for some very uncomfortable eye contact). 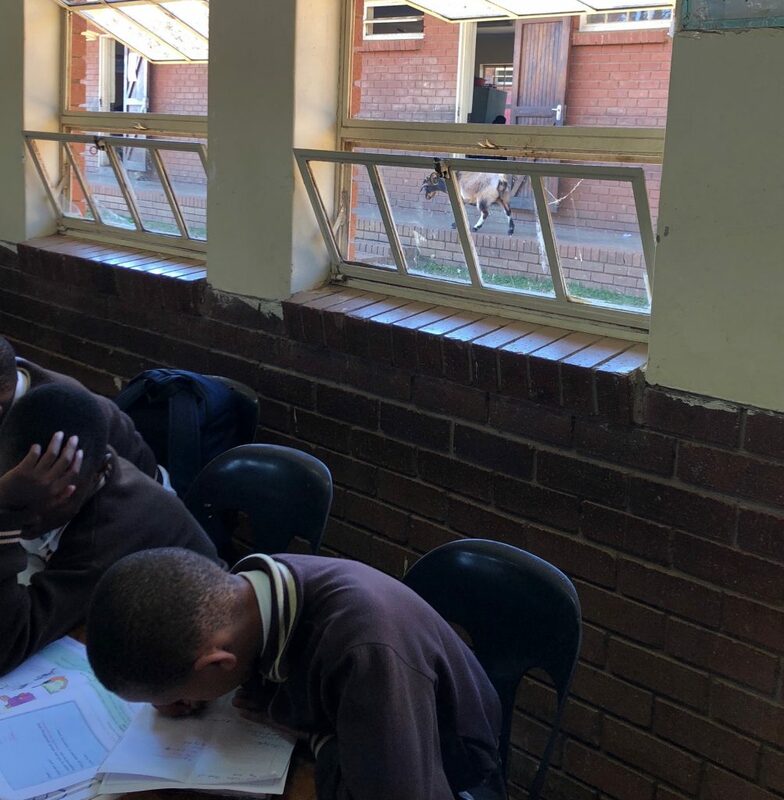 At the bottom of a winding dirt road, in the heart of the valley of several township communities, is Slangspruit Primary School. While in Umhlanga, I visited my young cousin, Rebecca’s, Elementary school to see how it compared to the township school I have been working in. Rebecca’s school is a model C school, which means it is partly funded by the government but mostly by private school fees. We had to first weave our way through a mass of parked cars in the parking lot. I admired the freshly cut green grass and colorful garden hedges lining the entrance to the school. The schoolyard was equipped with a playground, sand box and teeter-totter. The classroom was bright and colorful, with the children’s artwork displayed on the walls. The twenty or so students were hanging up their jackets and backpacks on hooks in their cubbies, before taking their seats at their assigned desks, while waiting for the bell to ring. The teacher encouraged me to spend some time in her classroom. She wanted me to see the other side of South African education, so I would not go back to Canada with a single story of what education is like in South Africa. As with everything in this country, there is such diversity. It is a land of polar opposites. Slangspruit Primary School consists of three long brick buildings that lay parallel to each other. This means there are no hallways, just classrooms with doors that open onto the dusty, red dirt ground. Many of the doors are broken or unhinged; I once saw a child lift the classroom door from flat on the ground to fit it into the door frame, like a puzzle piece. It is important to keep the doors closed, otherwise the goats roam freely into classrooms in search of a snack. Most of the desks are cracked or broken; if a student pulls a desk towards them by the legs, the top wooden slab often detaches and goes crashing to the floor. At least half of the windows are broken or are missing completely. The early morning air can be frigid and sometimes students spend classtime trying to cover the empty windows with lined paper using masking tape. Heat can pick up quickly though, and by 12 pm it can be a sweltering 30 degrees (and that’s during winter!) Some of the classrooms have had fans installed. On one particularly hot day I turned one on, only to watch in horror as the fan rattled and swung loose from the roof, in danger of decapitating the group of children working beneath it. “Don’t worry, Miss Emily, it does that,” one of the students informed me, completely unbothered. Classes are crammed with 40-50 students which leaves little space for movement. It is tricky trying to maneuver amongst the 50 kids with their 50 backpacks lying on the ground, as there are no storage lockers or cubbies. The teacher I have been shadowing, has solved this problem by simply not moving from her chair at the back of the room. She calls students to her to have their papers marked, and has designed a tool made out of straightened wire coat hangers that she uses to extend across the classroom to push open a window or do whatever other task requires her attention. The students are provided with one hot lunchtime meal a day by the school, usually either oatmeal or canned beans. The food is served in several large painter buckets. The children gather eagerly around the buckets, dipping in their hands and cupping up the warm brown mixture. Watching them in moments like these, it’s hard to fathom how just 30 minutes away there are people living such a different life experience. 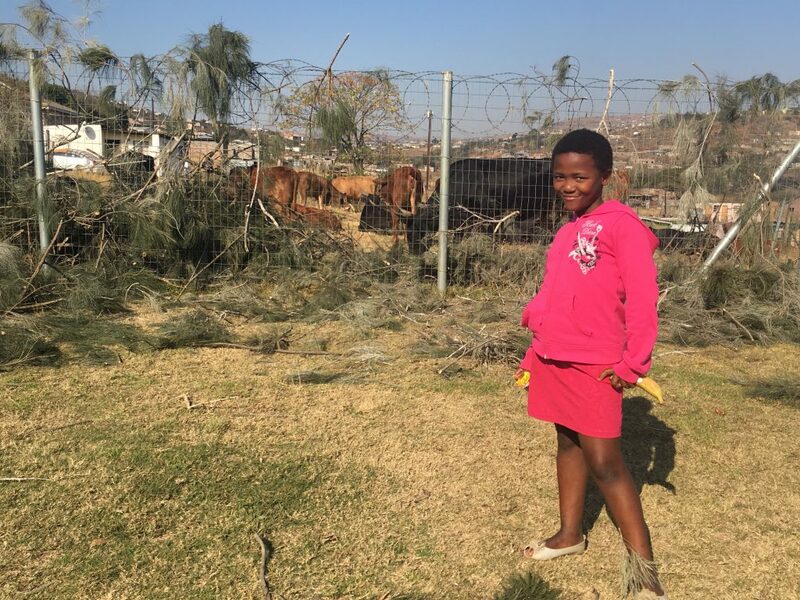 One of the girls posing in front of the herd of cows that wandered into the school yard after the trees were cut down. This isn’t just the difference between private and public schools; it is the difference between the privileged and the non-privileged. This is the legacy of apartheid. 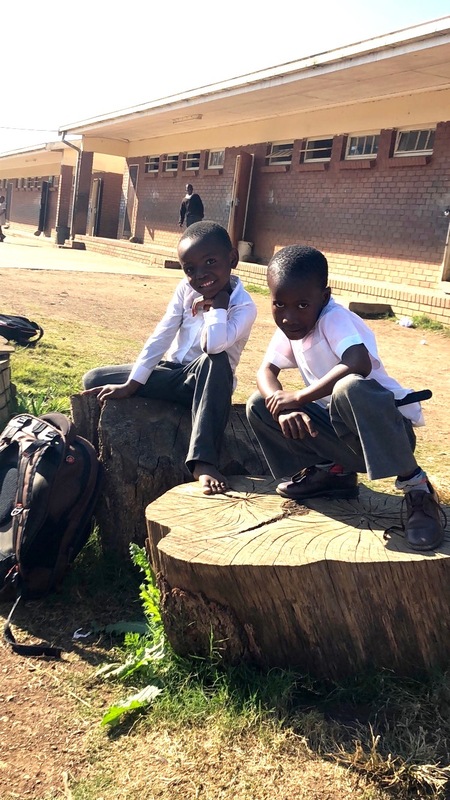 The children at Rebecca’s school live completely different lives to the children growing up in Slangspruit. Yet, they have much in common. If you ask a child, “What do you want to be when you grow up?” Many will give you the same answer. “I want to be a doctor, a pilot, a teacher, an astronaut…” These children have the same dreams, the same ambitions, and the same potential. What they are missing is opportunity. Mending South Africa will take years. Apartheid may be over on paper but it certainly is not over economically. It is easy for me to bask in my white-privilege and enjoy the nuances it provides as I walk the sandy beaches of Durban, while enjoying my over-priced vanilla bean mocha. But, as I get to know these beautiful, strong African children, hear their stories of heartbreak and struggles, and share their dreams and ambitions, I find it harder to reconcile the stark contrasts of these two worlds. There are so many tragic truths to South Africa, and thinking about them makes my heart ache, but they are impossible to ignore. Hi there! I will be in Pietermaritzburg, South Africa for three months with my good friend Ainslee. We are working with Ukulapha which is a community outreach program that is partnered with the township Elementary school in Pietermaritzburg. My family is South African and so I have always felt a strong tie to the Country, and a great respect and appreciation for the culture.  I have just completed my final year in Child and Youth Care at UVIC which has taught me a lot about the importance of having a strength-based practice that is rooted in cultural sensitivity and empathy. I am excited about applying what I have learned from my degree, but am also well aware that I am much more of a learner than a teacher in my role as an intern!